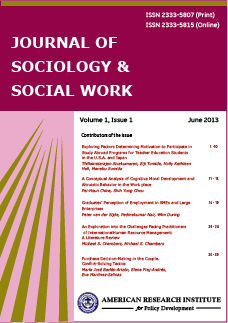 Journal of Sociology and Social Work is a scholarly international journal in its fields. The journal remains a leading voice for analysis and research in the social sciences. The journal welcomes research papers from all areas of sociology, with an emphasis on theory building and innovative methods. AJS strives to speak to the general sociological reader and is open to sociologically informed contributions from anthropologists, statisticians, economists, educators, historians, and political scientists. The journal also publishes articles that promote, debate and analyze current themes and issues in social work theory, research, policy and practice. The journal follows double-blind peer review process. Each paper published in Journal of Sociology and Social Work is assigned a DOI®number, which appears beneath the author's affiliation in the published paper. Click HERE to know what is DOI (Digital Object Identifier)? Click HERE to retrieve Digital Object Identifiers (DOIs) for journal articles, books, and chapters. Prof. Dr. Felix O. Chima, Prairie View A&M University, USA. Prof. Dr. Vance Cortez-Rucker, Lamar University, Beaumont, TX, USA. Michael O. Akintayo (Ph.D), Metropolitan College New York, USA. Prof. Dr. Ousmane Bâ, School of Social Work, University of Moncton, Canada. Dr. Margaret M. Munyae, United States International (USIU) Africa, Kenya. Dr. Kankam Boadu, University of Cape Coast, Ghana. Prof. Munyae M. Mulinge, United States International University (USIU), Nairobi, Kenya. Dr. Grace Etuk, Dept. of Sociology, University of Calabar, Nigeria.